buds squiggle around uncomfortably until your tiny ears throw them out like they don’t belong there. Our unnaturally small ears have long battled the beefy earbuds and manufacturers have finally taken notice. Last couple of years, we have seen more inclusive earphones that have been a boon for people like us. It not always apparent that these are suitable for small ears. But we test earphones for a living, so we have the inside scoop on the 15 best earbuds for small ears. We have covered everything from durable earbuds to the best wireless earphones for TV. 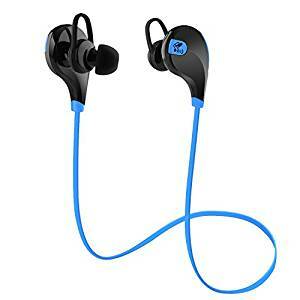 Will these best earbuds for small ears stay in my ears while running or moving? Ear pieces’ size: Most of the ill-fitting earbuds have a large driver casing and a hefty driver protruding from it. These tend to hurt the ears at the entrance of the ear canals. They also feel like they are clogging the ears when they sit inside the ear canal. Some of the newer earbuds, especially the single-driver ones, are designed with smaller than usual housings. These sit tight in small ears without hurting the area around the entrance of the ear canal. Eartips: All the best earbuds for small ears come with eartips of three different sizes. They are usually mounted with the Medium-sized eartips. You can replace them with the Small eartips for better fitment. Some buds like the Sennheiser Momentum come with double-flanged eartips which are slightly narrower and longer than regular eartips. Comply foam eartips insert into ears and then expand to fit. They offer excellent seal and fitment. Ear Penetration: We folks with smaller ears are mostly concerned with keeping the eartip inserted in the ears. What if the eartip can sit just inside the threshold of the ears and still deliver awesome audio? Some of the sport earbuds come with Earfins which hold the earbuds steady and allow them to sit shallow in the ears. So even if your ear canal is narrow, they will stay in the ears without hurting it or falling off. Positioning: The best earbuds for small ears sit correctly in ears when positioned properly. You might have to fiddle around a bit initially. But you will find a position which gives you the best bass response out of those earphones. This position automatically offers the best seal and tight fitment. There are certain earbuds that should be wrapped around the back of the ears before being inserted in the ears. If positioned correctly, the stay much more stable in the ears than regular earphones. 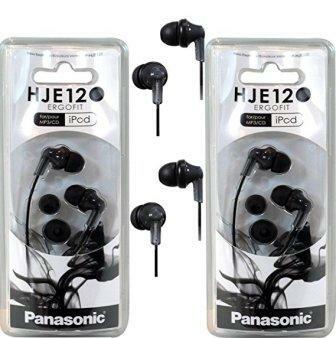 Material: Metal ear pieces tend to be heavy and fall off easily from the ears due to the weight. Generally metal ear pieces are pretty beefy too. It’s best to go for plastic or wood earbuds. These are lightweight and don’t weigh down your ear canal. Which are the best earbuds for small ears? Fitment: Since we were looking for the best earbuds for small earbuds, we checked out whether they fit in the small ears of our team members. We came across some earphones which hang close to the entrance of the ear canals. These can easily fit any small-eared person. We do recommend using the right eartip size for these earphones. Audio: Along with fitment, this our main priority while testing earbuds. We looked for earbuds that sit well in small ears and also sound great. For the pricier earbuds, we paid special attention to how the bass, mids and highs were balanced and the detailing of the audio. For inexpensive ones, we just went in for the enjoyable audio provided that the bas wasn’t too boomy. Accessories: We checked if the accessories of the best earbuds for small ears make life easier for us small-eared folks. A range of eartips sizes earned them brownie points. We also looked for earhooks for proper fitment and other essentials like a carry case. 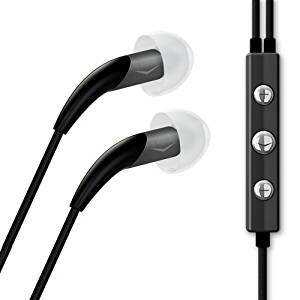 Features: We are always on the lookout for other features that make the best earbuds for small ears better. Noise-cancellation, inline mic and controls, and L-shaped plugs etc. add value to the product. Bluetooth connectivity and sports fitment help with the user experience. Budget: Differently-eared people can have a wide range of budgets. So we selected these 15 best earbuds for small ears across a large range of prices. Earphones in different price ranges were compared based on their value for money. Whatever be your budget, we want you to get the best value for your money. We have also written a complete guide about the best earbuds under 50.
from ANC, it has one of the most non-invasive designs for an in-ears. The audio is classic Bose and flatters all the genres. It is supported by a long battery life and a smart and compact inline control. This takes the top place in our best earbuds for small ears list. 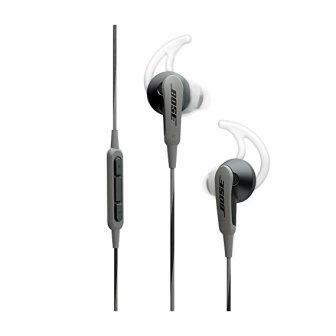 The Bose QuietComfort 20 noise-cancelling earbuds are beautifully-made and look their price. The ear pieces are compact and mounted with special StayHear+ eartips. These do not penetrate into the ears, which is surprising for a noise-cancelling unit. Rather they have a curved earfin which secures the buds to the ears. Folks with small ears can rejoice because this requires very less penetration into the ears. To be on the safe side, Bose packs three different sizes of the StayHear+ tips with these. There battery pack of these small ear earbuds in integrated inline of the cord. It’s a small flat box and does not add much weight to the cable. It is has a rubberized coat which may peel off with regular use. It has the usual power and ANC off/on controls. Another button it has is for activating the Aware Mode. It cuts out the ANC and lets you clearly hear the ambient sounds. This way, you can stay “aware” of your surroundings. The eartips do not isolate against noise properly if the ANC is powered off. The loose eartips deliver loud and clear music because of the powerful ANC. The cable ends in an L-shaped plug. The QC20 earphones also come in an alternate model, the QC20i. The difference between the two is that the former has Android-friendly inline control and the QC20i has Apple-friendly controls. The battery on these earphones last for 16 hours. They still function when the ANC is off but you hear more ambient noise. This set is an excellent alternative to the full-sized ANC headphones during air travel. Bose extracts the price for this convenience though. It comes with a smart zippered carry case too. The thing that you immediately notice with Bose QC20 ANC earbuds is the startling lack of noise. It’s unbelievable the kind of voodoo Bose can pull off with such a small device. The QC20 carries under-the-hood technology that makes their ANC as efficient as the full-size QC25s. The low-frequency noise is almost completely eliminated. This takes care of the AC hum and airplane engine droning on. Bose usually designs it audio response in such a way that it treats every genre equally well but doesn’t shine in any one genre. Even the bad recordings and lossy formats sound enjoyable on these. The downside is that they aren’t as revealing as other earphones of the same price. The digital signal processing involved in ANC also contributes to subtle sculpting of the audio. 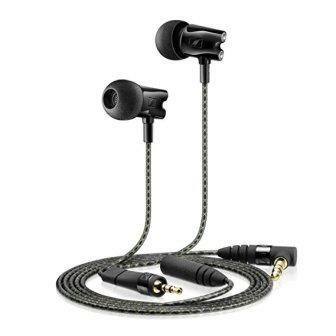 Other than that, these have a large soundstage and instruments get space to breathe which is rare in cheaper earphones. The bass and midrange are even and balanced with treble. Once you get used to the quiet background of your songs and the loose-fit convenience of the QC25, they quickly become your go-to earphones. Their audio might fall short of your expectations if you are a purist audiophile. But they pack amazing ANC and clear, balanced audio for the price. audiophile buds on this list. They only lose out on the top spot because of their hefty price tag. They don’t do purist audio either, these are real party mongers that combine excitement and finesse in a neat package. They are undoubtedly one of the best earbuds for small ears. The Sennheiser IE800 earphones are super lightweight and extremely compact. They have leveraged ceramic for creating the ear pieces. At 8g and small aperture, these fit like a dream into the small ears. They come with a range of eartips in different sizes too. Another advantage is that they don’t sit deep inside the ear canal. If you are the kind who doesn’t like headphones jammed in their ears, these will fit in with your requirements. There are twin rear openings on the back of the earpieces which boost the bass performance. The ear pieces are so tiny that you can sleep on your side with these on. They remain in the ears without causing physical fatigue over continuous use. They are glossy but scratch-resistant. Sennheiser has pulled an unexpected trick with the cable. Normally in earphones of this price range, the cabling is removable. In IE800, the cable is permanently attached to the ear pieces. But it connects to an extension cable right below the Y-junction which insures it against damage in the lower half. If the jack gets damaged, you can go for a replacement cable. Not that Sennheiser leaves any scope for damage. The cable is sheathed in Kevlar protection against regular use. It’s amazing that when all earphones in the high-end price range are trying to pack as many drivers as possible into their ear pieces, the Sennheiser IE800 employs a single dynamic driver. But this special driver stuns with its expansive dynamic range and ability to produce each frequency with precision. With the back exhaust, they produce a deep punchy bass that purists will accept grudgingly and everyone else will celebrate. The depth and definition of bass surpasses that of full-sized headphones. The midrange is as intricate and textured as you would expect from the price. It is quick and supported by an agile bass. There is no interference from the bass frequencies but the full force of lower-registers supports the midrange. The treble is as sharp as the bass. It digs into the source material and highlights the bad formats and recordings. So it’s best to use good quality audio files with these earbuds for small ears. 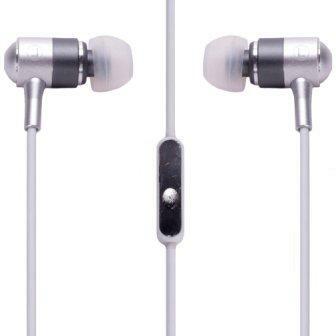 For an in-ear model, they have an open soundstage and clean instrument separation. They play the original soundtrack exactly as its intended without making them sound flat like purist headphones. ears will be delighted with the open non-invasive design. They have every feature that we can expect of a Bose headphone. They have the Bose sound signature that makes them compatible with all genres of music. What more do we need out of one of the best earbuds for small ears? The Bose SoundSport in-ear headphones have super-lightweight ear pieces, much like the QC20. The eartips angle away from the driver housings. They come with the StayHear tips that have a curved fin. This holds on to the small of the ears and keeps the buds secure while you move about. It’s an unfamiliar feeling at first because the ear pieces don’t jam into the ears. They still stay put in the ears while working out. The open design of these earphones lets ambient noise in, which is preferred while exercising in a public place. But if you want good noise isolation, these aren’t for you. These earbuds for small ears have a 42-inch cable. You have the option of getting one with an inline control or one without it. Even with inline controls, you have the choice between Android-friendly and Apple-friendly models. There are three buttons, one multifunctional control and two for volume/track navigation. The cord terminates in a straight plug. Earlier models of these tri-port earphones had modular cable with an armband. We didn’t have much issue with cable tangling or microphonics. As part of accessories, you get three different sizes of the StayHear eartips. You also get a neoprene zippered case with a carabiner clip. The accessories are designed for sportswear. These earphones come in a variety of colors. The Bose earphones usually go for safe sound signature that can work with every genre and format. The trade-off is that they aren’t hugely detailed. Still, they have much better resolution than stock earbuds. They bass is strong ad punchy without being too bossy. It extends a good deal into the lower frequencies so the audio doesn’t sound hollow even at low volumes. The midrange has good clarity which serves the rock and classic genres well. The treble detailing is also good for the price. Though treble has a bit if harshness which may make them sound bright in treble-heavy songs. The soundstage is decent but not as expansive as the QC20. These have limited noise isolation due to their open fitment. pretty low-profile but they stick deep into the ears. 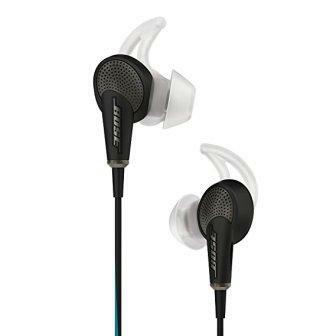 These are exceptionally noise-isolating without active noise cancelling. The neutral audio is easy to equalize and purists will love the precision. Their place in the best earbuds for small ears is well-deserved. The Etymotic HF5 earbuds are exceptionally slim and sit deep inside the ears. They are a nice change from the humongous earbuds that we usually see around. Part of the earbuds sits inside the ears so when properly worn, they don’t even show outside. The eartips come in different sizes and types. The narrow eartips also fit well into the ear canal. They come with triple-flange eartips which can be moistened and inserted into the ears for an easy fit. The foam eartips also fit snugly and also provides proper noise isolation. In spite of the tight fit, these are surprisingly comfortable probably because the ear pieces don’t weight down the ears or hit any pressure spots like large earbuds do. These Etymotic earbuds have a 4-feet reinforced cable. This is pretty much immune to damage from everyday use. The cable barely has any microphonics. These buds have replaceable filters to tune the audio response. They come with a filter replacement tool. An earwax removal tool is also packed with them since they rest so far into the ears. You also get a zippered carry case ad a shirt clip to hold the extra cable length. Apart from a black model, they also come in a Cobalt shade. The Etymotic HF5 earbuds are a purist audiophile’s dream. These deliver spot-on neutral audio that can be EQ’d for all the subtle genres. These are not primed for EDM and hip hop though. The bass has a defined and detailed nature that serves as a nice undercurrent to the midrange. It’s agile and responsive but not oomphy like the fun earphones. This shows in the hip hop genre. The midrange is clean and very intricate in its details. Set in a nice soundstage, the vocals and guitar sound clear and airy. They are silky smooth compared to the Bose earbuds. The treble range is crisp and highly extended. They sparkle in the highs without any of the bite of the harsh upper frequencies. Additional to their neutral nature, they sound quite natural in the rise and decay of their tones. They play audio in its most organic form. bring high-end sound to an affordable budget. Sennheiser has managed to walk the tight balance between quality and price. The lightweight and small design fits in nicely with the requirements of people with small ears, hence their place in the best earbuds for small ears list. The Sennheiser Momentum in-ear headphones have uber-light ear pieces. These have aluminum reinforcements but the major part of construction is in plastic. The low weight create negligible fatigue even when you use them for hours. The ear pieces are also average in size. So they do not press against the area around the ear canal entrance. The cable is connected directly to the barrel of the driver casing and passes through a loop for better stress relief. The ear pieces are glossy and done in black and red. These earbuds come with three sizes of silicone eartips and one set of double-flanged eartips. The cable of these earphones are flat and hardly tangle in our experience. The cord terminates in a sturdy L-shaped plug. While the angled design relieves strain, the casing is slim, so it can fit through any phone case. There’s a three-button inline control on the cable. You can choose between Android and Apple versions. The cable is non-detachable, so be sure to pick the right version. The mic and multifunctional buttons of either remote will work with all platforms but the volume navigation only works with the designated platform. Like their larger over-ear cousins, the Sennheiser Momentum in-ear headphones are fun headphones. They bring their energy and clarity to every genre. But they maintain a balanced audio signature throughout. The bass runs deep into the sub-bass region. These lower registers support the audio even at low volumes so they don’t sound tinny. The sub-bas capability of Momentums is surprising given the price. The bass is well-defined and peppered with detail. Because of the kicker sub-bass, these earbuds sound fun without any bass boost. The midrange has excellent clarity and detailing for the price. The treble is bright and sparkly. Folks who are used to bass-favoring IEMs might find the treble edgy. But we didn’t find it harsh or overly bright at any point. Between the punchy bass and dynamic treble, the mids may seem a bit recessed. Again, this depends on the user’s perception. and do not hurt the ears while delivering enjoyable music. Most of the users have appreciated how comfortable these are to wear and sleep with music on. If you are looking for a basic earbud to enjoy your playlist, these are the best earbuds for small ears. 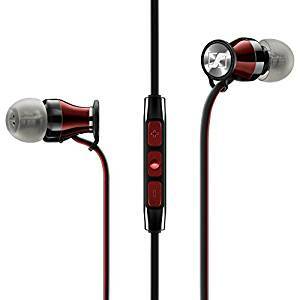 The JVC HAFX32P Marshmallow earbuds are touted as the most comfortable earphones by almost everyone who has used them. They look like they can fit well into the small ears. Its courtesy the memory foam eartips that hug the driver post tightly. They look more compact than the silicone eartips. Once we tried them on, we found that they fit like a glove inside small ears. You get to choose from small, medium and large foam eartips. With continuous use over last few months, we haven’t seen the eartips disintegrating or losing their bounce. The ear pieces are bulbous but not too large. You can sleep on your side with these on. These earbuds are connected to a 4 feet long cable. There are no inline controls on these. The debate is open on this point. Some people like the lack on inline controls and argue that it reduces accidental dialing. While others would like that extra convenience. The cylindrical cord ends in a straight plug. These are affordable earbuds that have lasted for at least a year with us. The earbuds come in funky colors and are clearly marked left and right. There are no accessories. The JVC HAFX32P Marshmallow earbuds aren’t pricey enough to be critiqued for their audio. These are budget buds that sound better than some stock earbuds. They have a warm and thick audio response. The bass has a decent punch which complements every genre well. It doesn’t have the detailing of the pricier earphones but the bass brings energy to the music. The vocals sound clear and have decent details for the price. The high are rolled off just enough to the take the bite away. The memory foam eartips of the Marshmallows plug into the ears snugly and provide good noise isolation. If you need a break from people around you, these are a great pair. Fiio is known for their headphones amps but they have quite the collection of earphones and headphones as well. The EX1 Aerospace is a metal-made unit which is a complete steal for its price. Fiio’s experience with the intricacies of audio is put to good use here. With their reasonable pricing, they fly straight into the best earbuds for small ears list. Fiio EX1 Aerospace Nanotech Titanium earbuds have a metal construction. So they may feel a tad heavier than the plastic buds on this list. They are made partly of lightweight duralumin and partly of steel. But the eartips project far out from the driver housings, so the latter never rub against the ears. There are vents in the ear pieces which lend an airy quality to the audio. The eartips angle away from the driver casings for an ergonomic fit. These earbuds come with 9 pairs of eartips. These come in three types of silicone material in three sizes each. We wish they had packed some foam eartips too but we were happy with the small-sized tips for our freakishly small ears. The cable is intertwined with Kevlar strands which lend it the reinforcement required to suffer the regular use. The cord terminates in an L-shaped plug covered in a metal case. These are purely musical headphones so you don’t see any inline controls. A classy zippered case is also supplied with the pack. Given the price, the build quality is exceptional what with the metal and Kevlar. The Fiio Ex1 Aerospace Nanotech earbuds are neutral but fun, a rare combination. The bass is punchy and extends deep into the sub-bass. The lower-end excels in both quality and quantity. There’s a hint of warmth to the audio but Fiio tries to stay balanced. The midrange are startlingly smooth for the price. They have a good amount of details with an airy character that complements all genres. The vocals ring clear against solid bass. The treble is revealing and sparkles in the good quality formats. People used to rolled-off treble may find it a bit edgy but they only made the audio sound crisp to us. Thanks to the vents, these have an ultra-large soundstage for the price. This gives the audio that spacious and airy quality. But the vents also prevent proper noise isolation so the ambient noises flow in. ears. These are over-the-ear kind of earbuds that can take the abuse of everyday running and workout. These are budget earbuds meant for an active lifestyle on a budget. It’s an extra perk that these are one of the best earbuds for small ears. 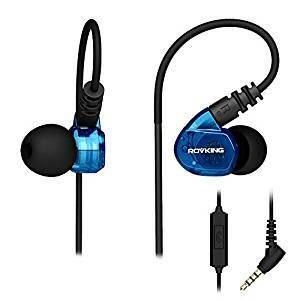 The Rovking running headphones have the design which requires the cable to be hooked around ears. Those who are used to normal earbuds would find the feeling of these a little strange. The earbuds are larger than the usual bud but they are smaller than those of this kind. These can fit into small ears. In fact, they stick on to the ears and stay put even while you run. The eartips sit deep into the ears. These come in 4 different sizes instead of just 3 sizes. These earbuds have memory wire connected to the ear pieces. When wound around your ears, it adapts this shape and gives you a customized fit. The cables from both the earbuds are thick. But they get tangled if packed in a small space. We wish they had gone for flat cables. The Y-junction is reinforced with plastic casing. The 51-inch cable ends in a 45° angled plug. This relieves stress on the jack. The cable has an inline control with a single button. This can be used for Play/Pause/Call Answer/Reject and for track navigation. 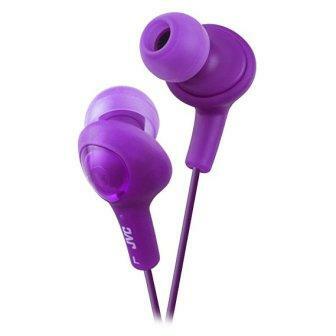 These earphones for small ears are available in some jazzy colors. A shirt clip is included as the sole accessory to manage the length of the cable while running. The Rovking running headphones are a budget unit so we weren’t expecting miracles. However, we were happy to notice that these have a full sound. The audio response tends a bit towards bright and sounds clear. With these affordable earbuds, it’s always good to tweak the audio response with the Equalizer on your music player. For the EDM and hip hop genres, we jacked up the bass a little and these came out sounding dynamic. The mids are decently detailed and you get a good kick out of rock and jazz genres too. The audio is very balanced for the price. Most earbuds in the same price range as the Rovking end up with boomy bass and muddy audio response. The deep-set eartips provide good noise isolation when running or working out. we have often featured them as one of best budget buds. Once we started looking for the best earbuds for small ears, we found that many of their users laud their ability to fit into small ears. 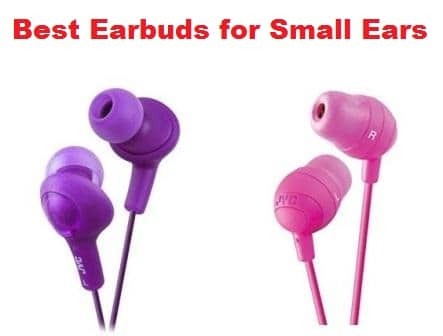 These are small and basic earphones with big sound. The Panasonic ErgoFit earbuds are well-made. The ear pieces are quite curvy but they are lightweight and compact. The eartips angle away from the ear pieces. They are made completely of plastic and do not weigh them down. They come with eartips of different sizes: small, medium and large. The small eartips fit well into the unfortunately small ears of our team members. The ear pieces don’t stick out from the ears either, so you can sleep with these on. They live up to their name given their ergonomic fit. The stock earphones often pop out of smaller ears because of their hefty ear pieces. The ErgoFit is specifically designed to combat that problem. These earbuds have a 3.6 feet long cord. It terminates in a straight plug. This is a cylindrical cable but it doesn’t tangle very easily. We do wish that the cable was an even 4-feet long because it feels a bit short when we are trying to slip the playback device into our pockets. It comes in 9 different colors, all of them peppier than the next. The cords are color-matched with the cables. Some of them have a single-button inline control that works with both Apple and Android devices. The Panasonic ErgoFit earbuds so popular because of the value they bring to the cable. The audio has a lot of punch for a budget earbud. We never found the bass too tinny on moderate volumes. The audio sounds full and clear with all genres. They are comparable to the stock earphones that come with Samsun Galaxy A7 which have a warm and rich audio signature. The treble is as energetic as the bass but it never gets too harsh. The midrange is clear and not veiled by the bass. They can keep the music to themselves at normal volumes. But if you crank up the volume high, your playlist will become public. lightweight, sturdy and life-savers for the small-eared demographic. The area it really shines in is its detailed and revealing audio. Klipsch goes full audiophile on use with X11. We spared no time putting them on the best earbuds for small ears list. The Klipsch X11 earbuds have a new and innovative design. They remind us of the nozzle of pipes at fuel bunks. The driver housings are very slim and shaped like a cylindrical tube. Part of it is featherweight aluminum and rest is plastic. Although they host a balanced armature driver, they weigh only 10 grams. These come with proprietary oval eartips that sit comfortably in ears of all sizes. Klipsch packs 5 sizes of these. The eartips manage to hold the ear pieces steady pretty well. The cable of these earbuds for small ears is reinforced with Kevlar. It is thin but proved to be sturdy for regular use. There’s an inline control with Apple-friendly controls. The cable does not weigh down the light ear pieces either. You can wear them for hours without feeling them in the ears. These come with a handy carry case. The Klipsch X11 earbuds create an excellent range with a full-range balanced armature driver. The audio signature is neutral with a hint of brightness for that clarity. The bass has a nice low-end punch from its extension into the sub-bass. It is tight and agile on its feet. The midrange swings against this solid bass. It is opulently detailed and well-suited for playing nuanced classical music. The treble of these earbuds is sparkly and on point. It feels like it has a bit of a bite with some songs. But once you get used to neutral audio, this will not be a problem. The soundstage is expansive for buds of this size but they still fall short of full-sized headphones. that’s not the only stand-out thing about them. They have a full and rich audio signature which is hard to find in this price range. The modern controls and the antique aesthetics find them a place in the best earbuds for small ears list. 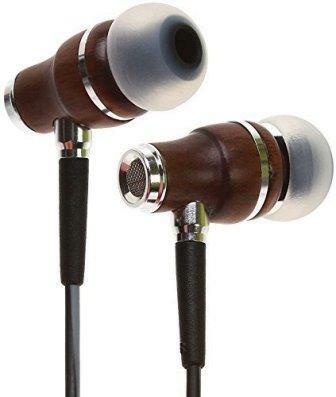 The Symphonized NRG 3.0 earbuds have wooden ear pieces. These are not just a cosmetic choice. Wood tends to bring warmth to the audio. The ear pieces are beautifully finished by hand and may vary in color, given the nature of wood. They have a metallic ring highlighting the center of the driver casing. The ear pieces are compact and lightweight, thanks to their wooden design. These ear pieces get through regular usage but we recommend not being too rough with them. The eartips project straight out of the ear pieces. You get small, medium and large eartips. The first fits the small ears well. These earbuds have a tangle-resistant cord. This has an inline control with Apple-friendly controls. The multi-functional buttons work with every phone. But the volume controls may not work with Android. You can activate voice commands on Apple devices using the multifunctional button. You can select from models with cords of different colors. The cable ends in a 45° bent jack. This is compromise between the safety of an L-shaped jack and the convenience of a straight jack. The NRG 2.0 had a microphonics problem with their cable. With NRG 3.0, we hardly get any cable noise while moving about. These earbuds come with an earthy and eco-friendly pouch for carrying them around safely. The Symphonized NRG 3.0 earbuds have such a brilliant and textured sound that we couldn’t believe their price. The audio is balanced and deliciously layered. We guess, the wood might be lending the warmth to the audio. The audio is set in a highly spacious soundstage. The instruments are separated precisely with lot of airflow between the layers. The bass is full and oomphy. It is well-defined and extended. The sub-bass ensures that they don’t sound tinny on low volumes. These earbuds also do justice to midrange-focused genres like classical and rock. The vocals and string instruments shine through, supported by the defined bass. The treble matches up with the energy of the bass but doesn’t have any bite. It lends a dynamic character to the audio. The detailing is good for the price but not exceptional. are specially designed to provide that extra bit of bass that they need. The neat design and the durability speak of Sony’s experience in this field. These deserve an uncontested place in our best earbuds for small ears list. 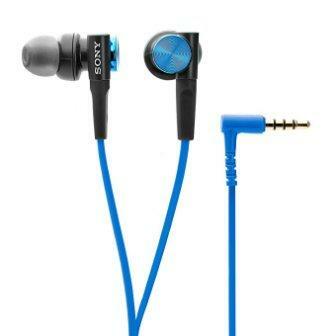 The Sony MDRXB50AP Extra Bass earphones are done in black and metal but they look pretty stylish. The driver housings are slightly large owing to the 12mm drivers for bass. But this doesn’t affect the fitment. The filter that projects from the ear pieces is slim and sits small inside the ear canal. They sit shallow inside the ear canal so small ears don’t fee plugged. The back of the ear pieces has a metal plate and the Sony logo goes on the post connecting the ear pieces to the cable. The ear pieces are lightweight and do not weigh down the ears in spite of the size. These earbuds come have a 1.2m flat cable. This ends in an L-shaped plug. The cable has a single-button inline control. This can be used to play/pause/answer/reject call. The cable resists tangles. The build quality is what you would expect of Sony and even at this price, it wows us. These can last years if treated with little care. These come with extra small, small, medium and large eartips. The extra small tips help them fit into those really small ears too. A carry case is supplied with the pack. The Sony MDRXB50AP Extra Bass earbuds deliver that bass they promise. The lower registers flow thick and punchy. There’s a definite bump in the mid bass that gives the bass that extra kick. These earbuds are not for purist audiophile but casual listeners spoilt by bassy earphones will love these. Genres like EDM, metal and Techno are churned out with much power. The midrange is slightly veiled because of the mid-bass bump. But it’s still clearer than the stock earphones. The vocals still stood out and we could understand the lyrics clearly. The treble is rolled off a little bit. If they had jazzed up the treble too, the midrange would have sounded really recessed. So we are happy with this decision. budget. The candy-inspired colors may not be for everyone but you get kicker sound out of these. We promised you budget buds and these are some of the best earbuds for small ears. JVC HAFX5V Gumy Plus earphones have average-sized ear pieces. But the eartip angle away drastically from the ear pieces. So the ear pieces don’t rub against the ears. The eartips sit deep and snugly inside small ears. Being made of plastic, these are super lightweight. They come with small, medium and large eartips. The eartips have a soft and pliant nature which makes them extremely comfy for small ears. The cable of these earphones run only 3.3m long. This is perfect for our height but taller folks may find it harder to use these with portable devices. The cord is color-matched with the earbuds. These come with 4 different shades. 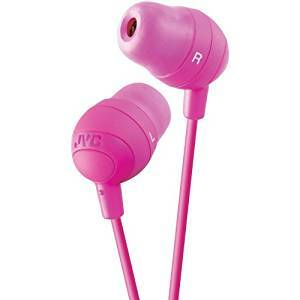 The JVC Gumy Plus earbuds are a very affordable set so we didn’t have high expectations. But we underestimated. These have a natural audio response that sounds full on normal volumes. You can hear more details than the usual stock earbuds. The bass is punchy but not particularly extended. The vocals are good and these down sound boomy or harsh. To us, these deliver the value for money. with high waterproof ratings. They are pretty affordable and work without any latency issues. These take dive into the best earbuds for small ears. The Senso Bluetooth earbuds offer a secure fitment. The have curved ear hanger which hook around the ears. The ear pieces project from these and position themselves right over the ears. The eartips protrude out of these ear pieces and sit shallow in the ear canal. These come with 3 sizes of silicone tips. There are volume/track navigation buttons and a multifunctional button on the ear piece. There is a mic on-board to make calls. These earbuds connect wirelessly through Bluetooth v4.1. The wireless range extends 30 feet. These have a battery life of 8 hours per charge. A USB cable is supplied to charge it. A zippered pouch is also part of the package. These are IPX7-rate waterproof which means they can stay under up to 1m water for up to 30 mins without damage. 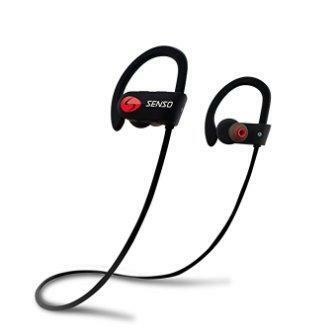 The Senso Bluetooth earbuds hold strong in their Bluetooth range. You wouldn’t have to worry about choppy connection with these. There’s also no lag as far as we could hear. The audio response is designed to be warm and enjoyable. It flatters all genres equally well. The audio quality holds up over the gym noise as there is enough volume range. budget earbuds with kicker audio. It’s a niche products that fits right into the demands of the best earbuds for small ears list. The ear pieces of Subjekt HPM21K HerPhones Petite earphones are made of lightweight aluminum. They have the glossy metal finish. These are visibly smaller than the usual earbuds. The eartips project straight out from the ear pieces. The part extending over the joint between the cable and the ear pieces is also reinforced with metal. These come with different sizes of silicone eartips. The cable of these earbuds is cylindrical and only marginally tangle-resistant. It has single-button inline control for Play/pause/answer/reject. It also has a mic to make hands-free calls. The Subjekt HPM21K HerPhones bring a lot of relief to small-eared people with their fitment alone. They deliver good audio as well. These do not sound tinny like earbuds in the same price range. The bass has body to it. The vocals are clear and there’s no harshness to the audio.